In the middle of September, an unusual scene took place on the Estonian-Latvian border. 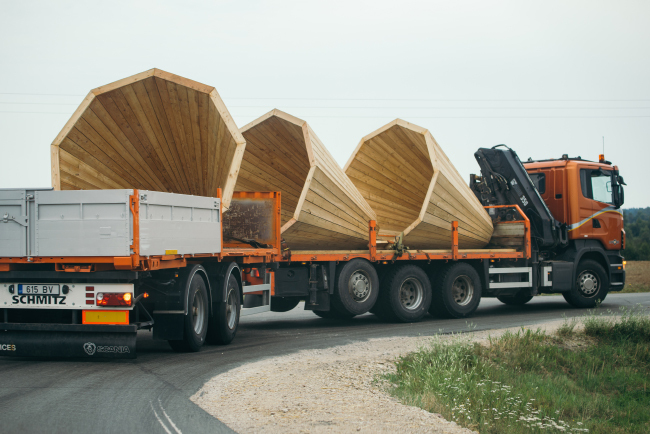 A truck pulling a platform trailer had hauled in three large, conical objects made from wood. The three funnel-shaped megaphones were then taken into the Pähni Nature Reserve and placed near some hiking trails. 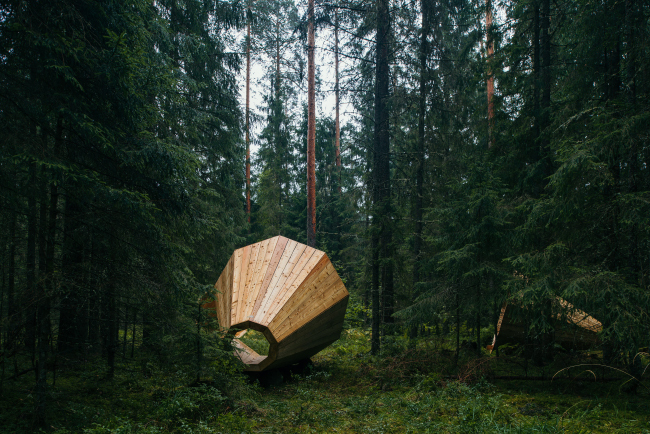 This installation set up in the southern forests of Estonia was created as a space for relaxation and meditation, to be enjoyed by hikers and anyone else who comes to the woods to listen to the sounds of trees and nature. Arterritory.com contacted the architect Aet Ader* – one of the driving forces in the team of designers and architects that brought together the group of architecture students from the Estonian Academy of Arts for the purpose of making this installation. Aet revealed that these architectural constructions symbolize our ability to hear, and therefore serve as a reminder to listen closely – which includes listening to our own thoughts. Aet believes that this can only be done by concentrating one's senses and tuning out all other surrounding sounds. This, then, is the purpose of the bullhorn-shaped installation made from larch wood. Aet points out that even the way in which the boards have been arranged along one another aids in amplifying sound. Could you tell us about the people on the team, and who was responsible for bringing about such a project? I met Hannes Praks for the first time a year ago, just after he had been appointed as Head of the Interior Architecture Department. As the location of our meeting happened to be a forest, I ended up complaining about how boring the forest infrastructure is in Estonia. The Forest Management Centre's hiking trail and rest area system is very nice, but why do we have to follow the “peasant-hut aesthetic” when creating new objects? Couldn’t we use the power of architectural thought, just a little bit, when it comes to spatial interventions in the woods? A couple of weeks later I got a call from Praks announcing that the next new group of freshmen will be focusing on the forest. All of us at the b210 architecture office were very intrigued by the challenge – finally, a chance to interpret a minimal space created in the forest. We invited a number of friends to inspire the students (filmmakers, IT experts, designers, architects, art critics), who all delivered one lecture each dealing with solitude, the forest, hiking, the perception of the body and space, etc. We had a legendary Estonian engineer consult the students on the construction aspects. 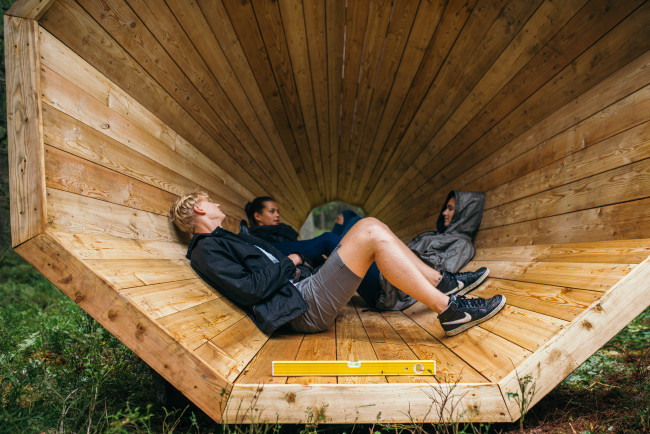 When we were halfway through the program, the Estonian designers Ahti Grünberg and Tõnis Kalve joined the team – for the practical reason that the students also had to take a furniture design course at the same time. This flexibility, and the joining up of the two courses, resulted in the making of stronger projects in the end – projects that had a strong idea behind them and that, at the same time, paid great attention to details and materials, such as wooden detailing, hinges, clasps, textiles and so on. What, exactly, is the function of this installation? And how would you like the public to use it? The megaphones are a surprise to the hiker – a shift in scale, an unexpected object on an absurd scale somewhere in the bushes near the Latvian border. It’s an extremely symbolic reference to the sense of hearing. The reference itself might be enough to inspire people to listen to the cosmos of the forest. When you pay attention, you might notice the way that sounds are amplified at the intersection of the three megaphones. You can sit down comfortably in each of the megaphones – the sides of the megaphone offer support for your back at the correct angle; and they frame the sky one one side, and moss and blueberries on the other. The installation shakes up the perspective. What is the secret behind this form of architecture? It seems to me that in a world that’s spinning faster and faster, the secret really lies in simple methods, such as focusing; erasing the background noise and the unnecessary – framing it out. *Aet Ader (of the architectural offices b210) was on the curatorial team for the 2013 Tallinn Arhitecture Biennale. She regularly participates in international art and architecture projects, and is a tenured lecturer at the Estonian Academy of Arts.